This certificate is a wonderful thing for any parent to see awarded to a child, but our family is a little different. If you don’t know me, you don’t know that ten and a half years ago I was presented with the option of terminating my first pregnancy twice because the child I carried had only half a heart and several other severe and life-threatening heart defects or that my husband Jim and I declined to put him in hospice care the morning after he was born. If you don’t know us, then you don’t know that my child almost died in the birth canal, again the week of his first open-heart surgery, and again two weeks before his third birthday. If you don’t know Liam, you wouldn’t know that the skin on his chest has been cut open six times, his sternal bone was sawed through five times, at least 21 different chest tubes and five sets of pacer wires were pulled through his torso. If you didn’t see the scars you wouldn’t know our son has cut-down scars on all of his limbs made so that surgeons could wriggle lines into his arteries and thread them all the way to his heart. If you didn’t know us, you wouldn’t know in my closet I have a binder full of consent forms that I’ve signed acknowledging that I put my son’s life at stake to save it. If you didn’t know Liam, you wouldn’t know that the Thursday before he started kindergarten, he was lying in a recovery room dry heaving and bleeding out his femoral artery after his twelfth heart surgery, the sixth one to happen in a cath lab. Even if you knew Liam when he was five-years-old, you didn’t see his blood pooling so starkly red on bleached white hospital sheets. Only one nurse, Jim, and I saw that. We watched that nurse lean into our son, putting pressure on his wound and eventually pressing a sandbag against it – literally a sandbag – to hold back the flood of blood leaking from our child. We are his parents, we’ve seen it all; we signed those forms. When Liam started kindergarten in 2008, almost five years ago, he shooed us out of the room. He was ready to start his life as a big boy at big-boy school. We were simply stunned he survived to start school at all. He still had bruises from his IV in his arm and was on head injury watch at recess because of aggressive blood thinners. This year, fourth grade, was not easy for Liam. Most of the boys at school played football, basketball, soccer, etc. at recess every day. Liam’s legs and feet are not the same size. He has birth defects in his bones that, in their way, rival the ones his heart and keep him on the sidelines when his peers get competitive. Then a little girl, through no fault of her own, broke his mended little heart. It wasn’t an easy year for our son as he looks down the barrel of middle school, just one year away, and simultaneously worries about the inevitable pacemaker and surgery to place it that his cardiologist abruptly mentioned over a year ago. When I was pregnant ten years ago, I said what all pregnant women say, “I just want a healthy baby,” but I had no idea what that even meant. Regardless, I did not get what I said I wanted. I will never get that wish for my son. However, for the past decade every time I’ve said to myself, “I just want him to be happy,” I meant every word of it, with all of my heart. Today my greatest wish came true. Liam is happy. More importantly Liam accomplished that happiness on his own despite extraordinary challenges that most people can’t imagine, much less most ten-year-old boys. Liam’s happiness is his achievement that he worked so hard to earn. 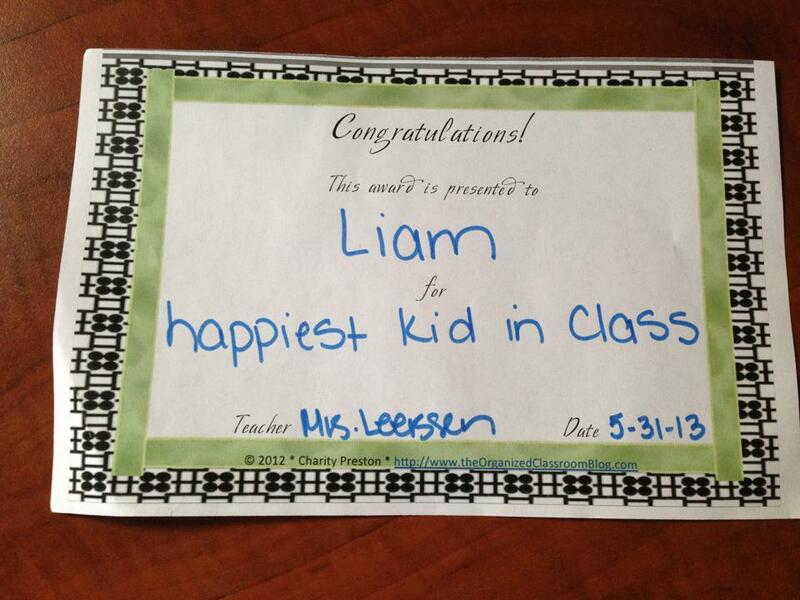 Liam is more than happy, he’s the happiest kid in his class. If he was the prettiest, most popular, most athletic, smartest, or funniest, none of those could make me as proud as having the happiest kid in class. I’m so proud of my son, Liam, he’s come so very far to accomplish something that so few people of any age can claim – happiness of his own making. I am so blessed to be the witness to a most amazing life. Congratulations on the award, Liam. I’m sure your happy soul is such a blessing to those around you. Amanda, you are right to be proud. Beautiful. I wish him much more happiness! Wonderful! My heart wells with tears of joy for the life your sweet boy has. When Annika was back to school, after being in the hospital, she couldn’t wait to show Liam her chest tube scar, because she knew he would understand! Thanks for sharing this about your precious, happy son! It fills my heart with joy that you boy has made it so far, with so much against him. Best wishes for him in the future.